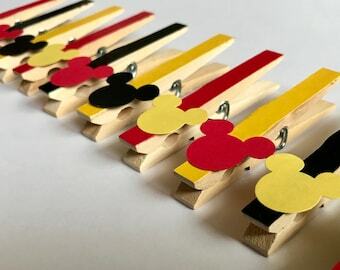 50 Clothespin clips featuring classic Winnie the Pooh designs for favors, gifts, prizes or games featuring the various characters pictured. Each clothespin in this SET OF 8 measures approx. 3 1/4" tall x 1/2" wide. NOTE THESE ARE NOT TOYS FOR CHILDREN UNDER 3. THEY CONTAIN A VERY STRONG MAGNET ON THE BACK. Copyright: All copyrights and trademarks of the character images used belong to their respective owners and are not being sold. This item is not a licensed product and I do not claim ownership over the characters used in my designs. The fee you pay goes towards the time used to create and personalize this product for you. Just as described! Excellent work and service! 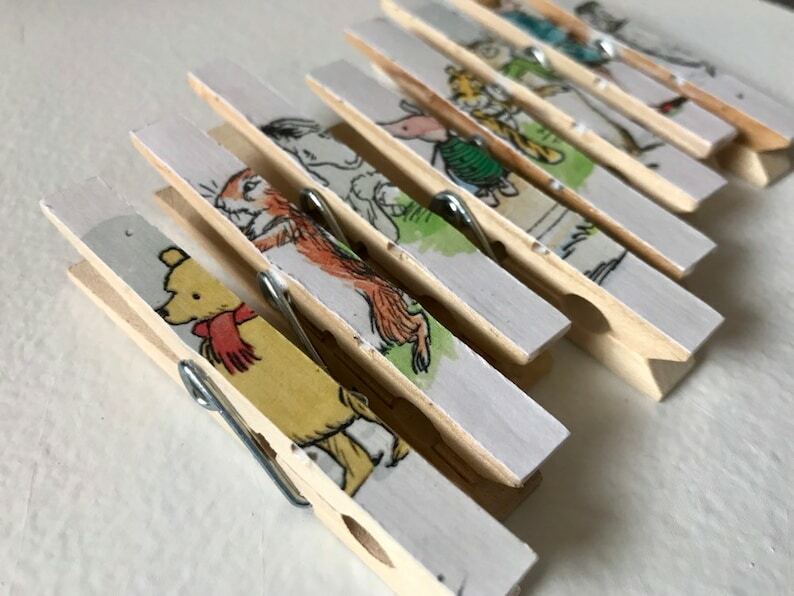 These vintage Winnie the Pooh clothespins are absolutely adorable. I am using them to hang baby clothes for my daughter’s baby shower. I love the artwork and detail on each one. Thank you! We accept direct credit card payments and Etsy gift cards. Contact me if you are unhappy for any reason and I will do what I can to make it right! Items are typically sent within 4 days of receiving payment, and you will receive a clear design time for any custom orders- very quick turnaround! Please keep in mind that any items containing magnets in my shop are not meant for small children -- the magnets are VERY small and VERY strong! They are secured to the clips with very strong adhesive but could potentially become loosened and pose a danger. THANKS! Copyright: All copyrights and trademarks of the character images used belong to their respective owners and are not being sold. This item is not a licensed product and I do not claim ownership over the characters used in my designs. The fee you pay goes towards the time used to create and personalize this product for you. Most items are created from recycled children's books. I am not recreating any imagery- just repurposing images into finished goods.